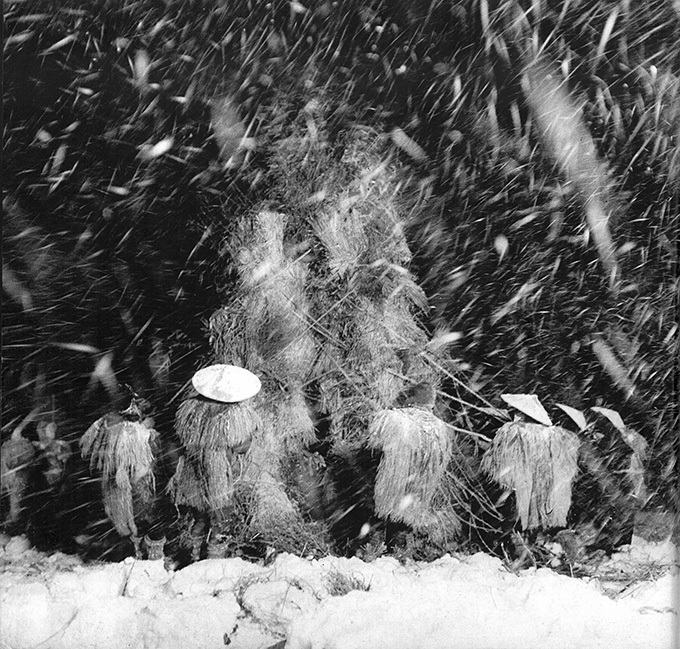 This article analyses the Snow Land photographic series by Japanese photographer Hiroshi Hamaya [1915–1999] in relation to issues of modernity, nostalgia and discourses of agrarianism in 1940s and 1950s Japan. Hamaya is one of Japan’s most celebrated and influential documentary photographers at both a national and international level. His Snow Land series presents an idyllic view of life in the small mountain villages of Japan’s Niigata Prefecture, emphasising a sense of community and spiritual meaning that Hamaya perceived to be lacking in modern society. In this sense, Snow Land constituted a critique of modernity. Through engagement with theorists such as Heidegger, Foucault and Barthes, as well as critical writings on agrarian ideology, this article investigates the underlying assumptions that govern Hamaya’s depiction of snow country, demonstrating that the series is shaped by a modern worldview and is tied to ideological discourses of agrarianism. Hamaya commenced photographing the Snow Land series in 1940 and completed the project ten years later. All of the photographs in the Snow Land book (1977), which was first published in 1956, were therefore taken either during wartime or in the most acute period of post-war recovery. Snow Land’s portrayal of village life in remote snowy areas of Niigata Prefecture, however, contains little trace of the war or its subsequent impact. Instead, the images convey nostalgia for a vanishing way of life in Japan. While one may justifiably criticise Hamaya for this shortcoming, it is not the principal intention of this article to do so. Rather, I consider these photographs in relation to theoretical work on how landscapes are represented in modernity, with a view to demonstrating how the singularity of Snow Land’s representation reflects a worldview on the part of Hamaya that is grounded in the rationalising logic of modernity. In this worldview, the rural landscape stands as a peripheral, objectified and imaginary space ready for access by the modern, urban observer. Following from this, I discuss how in wartime Japan this modern view of the pastoral was incorporated into state discourses in a way that highlighted the paradoxical nature of the urban/pastoral binary. The article thus considers Hamaya’s Snow Land not only according to a putatively universal experience of modernity, but also in the context of particular socio- political discourses in Japan both precedent and contemporaneous to the series’ creation. In other words, I aim to situate the Snow Land photographic collection within the international and local discursive systems that operated during the time of its creation. In his essay, The Age of the World Picture, Martin Heidegger (1977) defines modernity as the age in which representation becomes the principal means for humankind to understand the world.3. The first English translation, to which this discussion refers, was first published in The Question Concerning Technology (1977), a collection of Heidegger’s essays.] In modernity, the world becomes a rationalised object organised and explained according to multiple, intertwined scientific schemata. In this way, fundamental notions of the world are constituted in accordance with the centralised standpoint of humankind. The modern age, in other words, understands the world as a picture, an always-already posited image. This contrasts with the Middle Ages, for example, at which time the world was understood according to divine creation. During that period, “to be in being” meant “to belong within a specific rank of the order of what has been created” (1977, p. 130). Heidegger argues that although the world as a preconceived image is ontologically constituted through a variety of representational forms, the most pervasive are the sciences, all of which are unequivocally grounded in research. Thus it is through research that the world is made to stand before humanity in the modern age (1977, p. 118). One such science that informs the world-as-picture in modernity is ethnography, a discipline heavily reliant on documentation and data collection. Ethnographic documentation was a central imperative for Hamaya’s photographic expeditions into the rural snow country spaces of Niigata Prefecture, as demonstrated below. Hamaya’s Snow Land can be seen as both creative work and ethnographic research. While the series contains many dynamic and expressively composed images, the book is also a carefully edited and organised documentation of life in a small Niigata village. The project sought to record “the depth and richness of a spiritual life with a long history behind it” (Hamaya 1977, n.p.). This way of living was conceived of at the time by figures such as Shinji Ichikawa [1901–1982] and Keizō Shibusawa [1896–1963] as both exceptional and endangered. Hamaya met Ichikawa, an ethnographer, in Takada, a snow country town where the former was employed to photograph Japanese military training exercises. Ichikawa introduced Hamaya to Shibusawa, a wealthy amateur ethnographer who, with Ichikawa, persuaded Hamaya of the scholarly importance of photographically documenting life in the Niigata snow country (Reynolds 2013, p. 20). As an ethnographic work, Snow Land accords with Heidegger’s account of scientific research. Heidegger defines research as the enactment of procedures bound to a “ground plan” which is conceived in advance and subsequently guides these procedures (1977, p. 118). In Hamaya’s case, the preconceived “ground plan” is an idea of socio-historical development that positions the rural and the urban according to a teleological schema. Hamaya’s “procedure” is the rigorous production of images captured and arranged in a way that locates the snow country and its people within historical progression. In this sense, Snow Land is also an historiographical work, as Hamaya—a modern urban subject—essentially sought to capture a way of life that he perceived as a “primitive (始原的な)” remnant of a past “Japan (日本)” (Hamaya 1971, p. 35). This links the photographer with a long genealogy of Western anthropologists and ethnographers who documented other cultures as part of research into the historical development of humankind. According to anthropologist Johannes Fabian (2002), a fixation on human development often blinded anthropologists to the contemporaneousness of their research subjects. The human subjects of research were objectified as living relics and thus inferior iterations of humanity in comparison to the modern researcher (2002, pp. 25–35). Like these early ethnographers, Hamaya’s project attempts to capture a disappearing culture. However, where anthropologists depicted their subjects as inferior, Hamaya valorised Japan’s snow country as the site of an ideal lifestyle. According to Heidegger, it is no accident that in the modern age research is fundamentally anthropocentric. He argues that “the more effectually the world stands at man’s disposal as conquered”, that is, as possessed through knowledge of it, the more persistently the world is understood from an orientation that centralises humanity (Heidegger 1977, p. 133). Consequently, “observation of and teaching about the world” increasingly becomes “a doctrine of man” (1977, p. 133). Humanism, therefore, “first arises where the world becomes picture” (1977, p. 133). The study of humankind was of central concern for Hamaya, who said that throughout his career, “what captured and held my interest as a photographer was people and their problems. My work… began with the main “object: man”4 (Hamaya 1971, p. 214). On an international level, Hamaya’s photography became linked to a mode of humanism prevalent in the early post-war era that arose to counter the nationalism which had led to World War I and World War II. Blake Stimson (2006) notes how, in the decade following World War II, public intellectuals such as Franz Fanon and Jean-Paul Sartre advocated a concept of identity that transcended cultural and national boundaries. Rather than the nation-state or even a United Nations, “what was desperately needed”, according to these thinkers, “was a world community integrated organically, morally, and politically through the development of a new idée-force that gave form to new thoughts and new sentiments in the figure of a postmodern, postnationalist citizen of the world” (Stimson 2006, p. 15). Stimson goes on to argue that photography was seen as an integral medium for this new concept of global identity, largely because of a general belief that the photograph was an unbiased and democratic mode of representation. Photography, it was claimed, could provide a new “sense of belonging…distinct from race, language, region, and other national markers, and distinct from that of the transcultural marketplace” (2006, p. 20). Hamaya’s links to this broader global movement are evident from the fact that his work featured in the 1955 The Family of Man exhibition curated by Edward Steichen [1879–1973], the director of photography at the prestigious New York Museum of Modern Art. It is important to evaluate Steichen’s exhibition in order to compare Hamaya’s Snow Land with the particular kind of repre- sentation found in The Family of Man. This exhibition toured internationally for 8 years, attracting around 9 million viewers and symbolising an apex of post-war universal humanism in photography. The exhibition was a large collection of images taken throughout the world by various photographers and grouped under universal themes like birth, death and work. In Steichen’s own words, it was designed to present “a mirror of the essential oneness of mankind” and to communicate a “basic human consciousness rather than social consciousness” (Steichen 1955, pp. 3, 4). Stimson has argued that the The Family of Man was intended to counter a recurrence of the horrors brought on by the divisive nationalism that fuelled World War II. Despite such laudable intentions, the exhibition was nonetheless a “hopeless attempt to reconcile universal with particular”, in which “political vision was understood to appeal directly to something universally human and primordial” (Stimson 2006, p. 11). Roland Barthes (2009) describes this type of humanism as a “very old mystification” founded upon the belief that “in scratching the history of men a little, the relativity of their institutions or the superficial diversity of their skins…one very quickly reaches the solid rock of human nature” (p. 122). …suppress the determining weight of History: we are held back at the surface of an identity, prevented precisely by sentimentality from penetrating into this ulterior zone of human behaviour where historical alienation introduces some ‘differences’ which we shall here quite simply call injustices. Hamaya’s representation of the snow country often exhibits the type of sentimentality that is criticised above. Specifically, the landscape and its inhabitants are depicted as symbolising harmonious community and hardy self-sufficiency. A ‘surface’ Japanese identity is produced in the Snow Land series that obscures the tensions that beset any community, such as those surrounding class and gender relations. However, Hamaya’s Snow Land is different from The Family of Man in one important sense: Hamaya was not trying to promote an idea of transnational unity, but rather, a culturally specific notion of Japanese identity. Yet there are still resonances with Steichen’s exhibition in his work: Hamaya’s Snow Land posits a sentimental and unifying ideal of authenticity for Japanese society that not only ignores the particular influences of history, place and culture in the rural landscape but also elides a sense of cultural diversity within Japan. In this sense, both of these photographic projects symbolise a modern worldview that renders the world as picture. In each instance, despite aspirations towards objectivity, the world is constituted as a subjective representation of a universalised sense of being that overwrites contingencies and particularities. The sentimental representation of the snow country in Hamaya’s photographic series clearly reflects a modern mode of subjectivity through its emotive appeal to a unified sense of Japanese identity. This representation signifies the extent to which Hamaya was at that time embedded within modern systems of knowledge production. In modernity, the physical landscape becomes ontologically peripheral to the human subject, and the rural landscape in particular is conceived of as exterior to the modern urban centre. This space is produced through the aforementioned sentimentality and also through a scientific mode of representation. A scientific approach is particularly evident in Snow Land in that many images in the collection display a clear attempt by the photographer to objectively document his subject. This reflects the influence of his encounter with the ethnographer Ichikawa, who inspired Hamaya’s documentation of village rituals in the Kuwadori Valley through immersive fieldwork which required him to “walk, observe, and feel (歩いて、見て、感じる)” (Hamaya 1971, p. 36). In his efforts to represent the snow country space as objective fact through observation, Hamaya also responded to his feelings by positing an imagined space that grounded his sense of identity both as a modern individual and as a Japanese person. In this sense, the photo series produces an imaginary site that Foucault entitles a “heterotopia”: an externalised utopic space anchored to multiple physical locations. Heterotopia simultaneously affirms identity and calls it into question (Foucault 1986, p. 24). In Hamaya’s representation, the snow country is experienced as modern society’s peripheral opposite, the pre-modernity of its modernity. In a moment of différance, to use Jacques Derrida’s term, the qualitative meaning of modern existence is confirmed by the positing of its opposite, but at the same time is undermined by a longing towards a seemingly superior utopic rural space (Derrida 1976, p. 23). It is not difficult to imagine that despite being physically present in the snow country for extended periods, Hamaya, as a modern Japanese subject, was not necessarily at home in this space. Instead, his time in the snow country must have been both stabilising and destabilising to his own sense of self. Figure 1: Plate 47 from Snow Land (Hamaya 1977). © Keisuke Katano. Reproduced with permission. The photograph resembles a diorama, an impression that is attributable to both the high angle from which the image has been taken and the distanced perspective; each aspect makes the landscape seem to be a miniaturised version of itself. The land is spread before the viewer to give a sense of the stage upon which the ensuing photographic narrative will take place. Furthermore, the manner in which the various lines and shapes in the landscape are carefully balanced gives the impression of a mapped space. Landscapes such as these are relatively rare in the book, with the majority of images depicting people undertaking preparations for traditional New Year celebrations. Within the context of the photo series, this image presents as a kind of “ground plan” (to use Heidegger’s term) for Hamaya’s more detailed documentation of village rituals (Heidegger 1977, p. 118). The photograph establishes a macro perspective to contextualise the images of human subjects that follow, which are taken from a much closer vantage point. The landscape presented seems external yet knowable to the viewer, and thus presents as an objective display. Figure 2: Plates 14–17 from Snow Land (Hamaya 1977). © Keisuke Katano. Reproduced with permission. The sequence from which the above montage is taken begins with an intimately close portrait of the man, after which the perspective shifts back to that of observer. The montage reflects Hamaya’s self-assigned role as documenter. This is achieved in three ways. First, the photographer has withdrawn to a distance so as not to disturb what is unfolding before him. Second, the chronological sequencing creates a temporal narrative that reflects the photographer’s wish to distance himself as narrator. Third, the absence of dramatic angles or other expressive framing techniques produces an objective aesthetic. The combined effect produces a ‘factual’ representation of the snow country space (much like the display of the Cairo street). Here, the snow country is carefully delineated and organised according to the rationalising logic of temporal sequencing. The space is presented to the viewer as a piece of objective information that can be incorporated into the broader world picture of modernity. The images discussed above (Figures 1 and 2) demonstrate how the rural landscape is produced as a space peripheral to modernity’s centre through rationalising logic. One consequence of this is that rural landscapes are also often represented according to the developmental logic of modernity as a retrograde past. This logic grounds a common perception of the rural landscape and its inhabitants as less civilised than those in urban spaces (Williams 1973, p. 1). More importantly for this discussion, such logic also contradictorily engenders nostalgia for an ideal lifestyle deemed lost. In the following section, I discuss the particular way nostalgia for the pastoral lifestyle in Japan features alongside attempts at pure documentation in Hamaya’s Snow Land. …a time of ‘blankness’ lacking former myths and other objects of unselfconscious worship. Lost are previous forms of sociability and the rituals binding them, artistic forms sanctioned by tradition, and a sense of continuous time stretching back into the past and promising to continue without interruption into the future. In the face of modern logic, the legitimacy of old forms of knowledge and meaning became “a receding echo”, retreating “steadily into a remaindered world of irrationality and ghosts” (Harootunian 2009, p. 83). Stefan Tanaka (2004) argues that this distancing of traditional from modern knowledge, and subsequently a distancing of humankind from the natural world, is symbolised in the Meiji-era replacement of the indigenous lunar calendar with the foreign solar (Gregorian) calendar. This new calendar was at odds with the timing of traditional events such as festivals and ceremonies, so that the experience of time in everyday life became disconnected from traditional practice. Daily life was now organised around the logic of the solar calendar, and events that had punctuated the old lunar calendar were displaced and became illogical within the new organisational context of modern time. As a result, Tanaka argues, “what had constituted experience and common sense… [was] now evidence of a lack of understanding and reason, immaturity, or childhood” (2004, p. 82). Thus, the imposition of the solar calendar by the Meiji regime had the effect of condemning “the very organisation of people’s lives” as “evil customs of the past” (2004, p. 9). Figure 3: Plate 83 from Snow Land (Hamaya 1977). © Keisuke Katano. Reproduced with permission. The wide frame of the image is crowded with people, yet none stand out as separate from the group. They all seem to be interacting with each other in different ways, suggesting a shared sense of purpose. Possibly through the use of a flash, the photograph has been exposed in a way that blackens the background and erases the contextual details, while at the same time highlighting the human subjects. This sharp division between foreground and background not only makes the image dynamic, but also seems to isolate the group of men, imbuing the scene with a timeless sense of community. These visual effects produce a surface impression of communal identity as fundamental to an authentic Japanese landscape. In the modern sense that Williams (1973) notes, the landscape has been divested of a sense of the real hardships of life in a mountainous and bitterly cold landscape. Instead, it is a nostalgic representation of an originary Japan that promises to be a salve for the loss of meaning noted by Tanaka (2004) and Harootunian (2009). As will be discussed below, this sense of the snow country as a rejuvenating space is one important way in which Hamaya’s Snow Land connects with the Yasunari Kawabata [1899–1972] novel of the same name. There are clear differences between the representation of the snow country in Hamaya’s Snow Land and Kawabata’s novel, Snow Country (雪国 [Yukiguni]).7 Kawabata’s representation is intensely personal and aesthetic, whereas Hamaya generally strives for objectivity. Despite this, however, there are important similarities between Hamaya and Kawabata’s protagonist, Shimamura. Both are men, native to Tokyo, who venture into the snow country in search of redemption. Throughout his novel, Kawabata emphasises Shimamura’s status as an urban male hollowed out by modernity. We are told, for example, that he is a dance critic who has slowly moved from critiquing Japanese dance forms, with which he became disillusioned, to studying Western ballet, performances of which he has seen only in books. This deliberate choice, made because “nothing could be more comfortable than writing about ballet from books”, suggests Shimamura’s detachment from the real world (Kawabata 2011, p. 17). Like Shimamura, Hamaya seemed also to experience a sense of disconnection from the real world in his urban life. This is most apparent from the fact that after making several trips to the snow country, he perceived his earlier photographs of Tokyo as superficial and meaningless. In a dramatic turn of events, he burnt almost all of his Tokyo film negatives in a traditional New Year’s bonfire held in one of the snow country villages he visited (Reynolds 2013, p. 21). The impression the woman [Komako] gave was a wonderfully clean and fresh one. It seemed to Shimamura that she must be clean to the hollows under her toes. So clean indeed did she seem that he wondered whether his eyes, back from looking at early summer in the mountains, might not be deceiving him. Although Hamaya strives for objectivity in Snow Land, at times he nonetheless reproduces Kawabata’s romantic representation of the snow country—in particular, the author’s habit of eliding snow country inhabitants’ individuality and simply depicting them as part of the protagonist’s experience of the natural landscape. The following photograph from Hamaya’s series (Figure 4) similarly appears to embed the depicted human figures into the surrounding landscape. In this dynamic image, the men seem to dissolve into nature, an effect engendered by the way the figures are arranged around the as-yet unlit bonfire, in a manner that incorporates them into the bonfire’s pyramid shape. This is reinforced by the vertical graduation of tones in the photograph, which integrates the men into the natural landscape’s tonal palette. This begins with the white snowy ground that blends into the mid-grey of the straw bonfire and the men’s coats, and culminates in the sky’s inky blackness. The distinction between human and landscape is further blurred by swirling white snowflakes. The subjects’ distinguishing features are not visible given both their distance from, and position in relation to, the camera. All of this evokes an impression that the men and the landscape have merged to form a dynamic visage of nature. 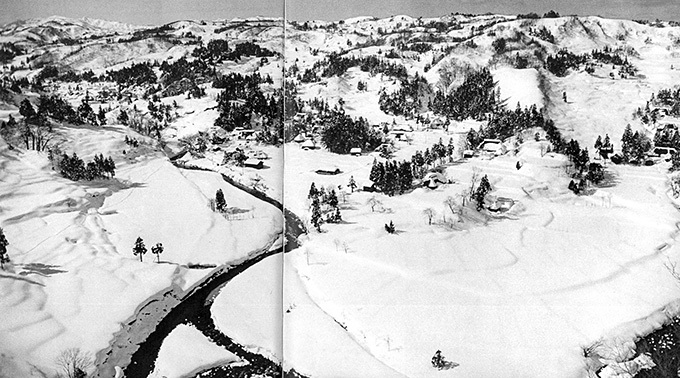 Despite at times striving for objectivity—as in the previously discussed landscape image (Figure 1) and the wakagi mukae montage (Figure 2)—this photograph suggests that Hamaya, like Kawabata, was also motivated by a sentimental and romantic notion of life in the pastoral landscape of the snow country. As discussed below, this connects Hamaya’s Snow Land with particular discourses around rural life in pre-war twentieth-century Japan, one of the most persuasive of which was agrarianism, or nōhonshugi (農本主義). Figure 4: Plate 81 from Snow Land (Hamaya 1977). © Keisuke Katano. Reproduced with permission. a ‘pure’ (or middle) peasantry engaged in smallholding cultivation within the context of an equally ‘pure’ village community (that is unsullied by an external capitalism) is presented as embodying all the positive and culturally specific in turn by these same peasants (=warriors-who-defend-the-nation). De- essentialization of the peasantry corresponds to alienation from an ‘authentic’ selfhood and thus estrangement from a ‘natural’ and ancient identity by a combination of ‘foreign’ others: capitalism, socialism and/or colonialism. Nōhonshugi, as the Japanese iteration of this agrarian myth, emerged as an ideology in the wake of the Meiji Restoration  and Japan’s consequent rapid modernisation (Havens 1970, p. 250). This ideology held that agrarian practices underpinned both the economic state and a unique Japanese spirit. As expressed by its leading thinker and practitioner, Kanji Katō [1884–1965], nōhonshugi was the suppression of “one’s ego through devotion to growing crops, an enterprise best performed by self-sufficient villages composed of patriarchal families” (Havens 1970, p. 254). According to Katō, there were several facets to the agrarian lifestyle that characterised Japanese essence. These facets include: physically disciplining the body through hard labour on the farm; resurrecting the fading practice of shrine worship; and practicing traditional martial arts. Farming and combat had to eschew modern implements and methods in favour of tradition, such as the hand-drawn hoe and the sword respectively (Havens 1970, pp. 256–57). A central motif of nōhonshugi was the idealised rice farmer, largely due to an historical association with rice as food and the aesthetics of Japan’s rice paddies. The Japanese rice paddy was considered to embody not just rural Japan, but Japan itself (Ohnuki-Tierney 1993, pp. 81–95). The rice farmer became so central to Japanese identity in the era between wars that by 1935, the Japanese anthropologist Kunio Yanagita [1895–1962] had come to define the “common people” of Japan solely as rice farmers (Ohnuki-Tierney 1993, p. 92). There are no depictions of rice farming in the Snow Land book, primarily because Hamaya’s series focuses on winter, during which the Niigata rural landscapes are mostly submerged in snow. He did, however, produce iconic images of rice farming in Uranihon (裏日本; lit., ‘Japan’s Back Coast’), a book published in 1957 as a follow-up to Snow Land. Incidentally, Uranihon also contained an introduction written by Kawabata, author of the Snow Country novel (Hamaya 1957). One of the most iconic images in Uranihon is the below image (Figure 5). Although this image is from 1955, long after the end of wartime, it nonetheless symbolises some key aspects of nōhonshugi. It conveys an impression of the rice farmer as a person of individual discipline and self-reliance, while at the same time emphasising the communal working rhythms of the harvest. The former is achieved by the centralised presence of the two women who fill the image’s frame, while a sense of coordinated harmony is produced by the manner in which the eye is drawn from the front figure towards the woman behind her. Harmony is further suggested by how the women are captured in symmetric pose while performing identical harvesting actions. These two aspects of the image position the women as archetypal figures, an impression accentuated by the fact that each woman’s face is covered. This has the effect of erasing context and subjectivity from the scene so that the women become generic signifiers of the idealised Japanese rice farmer. Figure 5: Plate 88 from Uranihon (Hamaya 1977). © Keisuke Katano. Reproduced with permission. Brass notes that in many modernising nations, agrarianism became incorporated into fascist ideology (Brass 2000, p. 20). It is therefore important to assess whether traces of agrarian fascist discourses might be found in Hamaya’s Snow Land photographs. Like agrarianism, fascism emerged in Japan as a response to growing dissatisfaction with capitalist modernity, endeavouring to provide new meaning via a foundational mythology of the nation state. Maruyama (1969) notes that, although there were clear formal differences between the Shōwa [1926–1989] regime and the regimes of Germany and Italy, the ideological underpinnings of each were ostensibly the same. One structural difference between Japanese and European fascism resided in the fact that Japanese fascism did not emerge as a populist movement. Rather, it was driven by a small but powerful presence in government and civil society which exerted a disproportionate influence on the state (Maruyama 1969, pp. 52–57). Despite this difference, Harootunian notes that in the final analysis each regime sought to “save capitalism from itself, from the excesses of civil society, and from the class conflict it was capable of producing”, largely by erasing the notion of social divisions and individual identity (Harootunian 2005, pp. 140–41). The particular national mythology espoused in Japanese fascism is worth exploring more fully to understand the discursive context in which Hamaya’s Snow Land was produced. It will also help with assessing whether or not Hamaya was influenced by state discourses. Dislocation from old patterns of living—in conjunction with the failure of the global economy that led to the worldwide depression of the late 1920s—confirmed growing doubts about capitalist modernity to many in Japan. Nina Cornyetz notes that, unlike Germany following defeat in World War I, in Japan there was no single definable event to which a prevailing feeling of loss could be attributed. Nonetheless, there still existed “a sense of cultural crisis that was widely experienced as loss” (Cornyetz 2009, p. 337). This was engendered by the fear that Japanese civilisation was overrun by the Western influences that had become intertwined with modernising efforts in Japan since the Meiji Restoration (2009, p. 337). By holding the promise of replenishing a sense of community and unifying purpose, fascism emerged as one response to the crisis of modernity. The disenchantment and isolating effects of modern life were addressed in Japan through the renovation of ancient mythology and emphasis on connection with nature (Tansman 2009, pp. 2–5). As already discussed, the ideology of nōhonshugi was central to this discourse because it promoted agrarian life as an intrinsic feature of national identity. In this way, fascism sought to unite the population, to provide a sense of superior cultural uniqueness that connected individuals and communities together. It thus appeared to provide an antidote to the fracturing of old family structures brought about by modernisation. While fascism promised a sense of unity, it also required significant sacrifice by Japanese citizens. The Emperor, as the symbolic head of spirituality and the state, embodied the higher force to which sacrifice should be made (Skya 2009). The national body was subsequently rendered sacred through its association with the emperor, and the emperor’s status as supreme kami—the apotheosis of nature’s power—meant that a nexus formed between the emperor, the state and nature (Picken 2004; Karatani 2012, p. 61). As a consequence, a central motif in Japanese fascist aesthetics was the frequent association of nature and the rural with an essential national identity. This extended beyond the realm of ideological discourse and into politics; for some political thinkers, agrarianism was a foundation for a new state model. Maruyama (1963) notes that among major political thinkers in the 1930s there existed a concept of the village model as an ideal upon which to base the Japanese state. For example, Seikyō Gondō [1868–1937], a central figure in the reactionary May 15 Incident of 1932, was highly critical of state exploitation of the provinces in the process of modernisation.8. Despite assassinating the head of state, the perpetrators received only relatively light punishment.] This criticism was driven not only by Gondō’s outrage at the abject poverty in rural Japan, but more importantly by his belief in the village model. According to Maruyama, Gondō wanted the state to be “based on the native-village community” and “built up from the bottom like a pyramid” (Maruyama 1963, pp. 56–57). Kōsaburō Tachibana [1893–1974], another key figure of the May 15 Incident, argued that agrarian life was an essential state of being for Japanese. In his Principles of Japan’s Patriotic Reformation, he wrote: “what is tilling the soil if not the very basis of human life?” He further claimed that “only by agrarianism can a country become eternal, and that is especially the case for Japan” (cited in Maruyama 1969, p. 43). Maruyama shows how agrarianism’s proponents (such as Gondō and Tachibana) were at odds with others in the Right who believed in industrial development. This led to a contradiction in the fascist state in that it sought wholesale industrial development on the one hand—thus privileging the urban centre over the rural periphery—while positing agrarianism as a cultural ideal on the other. For this reason, Maruyama points out that “as ‘fascism’ descends from the realm of ideas into the world of reality, agrarianism is bound to turn into an illusion” (1969, pp. 52–57). In other words, the fascist state—inherently militaristic and aggressively expansionist—could never subsist on agriculture alone, but must rely on the tools of modernity to achieve its expansionist aims at the expense of those who supposedly represented the agrarian ideal. In this instance, the instability at the heart of the urban/pastoral binary was made apparent in a material sense in the fascist state that relied so heavily on industrial modes of production. In the context of Hamaya’s Snow Land, it is important to note that the fascist state’s exploitation of the rural landscape and its inhabitants is not depicted in the photographs, an omission which further demonstrates how socio-political tensions are elided in his representation of the space. The illusory nature of agrarianism did not lessen its power in fascist discourse. As discussed previously in this article, the agrarian ideal of a close union between humans and nature is fundamental to fascism’s promised anti- modern utopia. This is because the agrarian ideal is the obvious antithesis to capitalist modernity in its communal-social formation. The connection to traditional mythology and folklore, and a relation to nature that was lost to urban subjects, became key ideological tools through which fascist discourse— utilising visual and literary art mediums—sought to mobilise the public. This discourse not only took the form of state-driven cultural productions, but ultimately governed cultural production.9 It thus came to shape works such as Kawabata’s Snow Country novel, and, I would argue, Hamaya’s photographic depiction of the snow country. In suggesting this I do not mean to imply that Hamaya consciously produced a work of propaganda. Rather, I argue that given the power of the Japanese state discourses and systems of knowledge operating at the time, it would have been almost impossible for these not to have in some way influenced his photographic work. We might note, for example, that Hamaya was employed by several state-sponsored wartime publications, including FRONT, a propa- ganda magazine intended for foreign audiences that showcased the various military aspects of Japan’s war efforts, alongside romantic portrayals of agrarian life in Japan’s colonies.10 Although Hamaya’s involvement in these projects can be explained by the fact that much work for freelance photographers during the war period came from the state, it is also clear that he was at times swept up in the militarist discourses of the era. He recounted later how he was intoxicated by the displays of military power he photographed: “Being in the midst of the explosive noise of the bombers and the deafening roar of the tanks set my blood racing. My sluggish spirits were swept away. I was wildly enthusiastic, thinking, ‘arrows or bullets, bring them on’” (cited in Reynolds 2013, p. 22). This enthusiasm seems to have been short-lived, however. Reynolds speculates that Hamaya’s decision to resign from FRONT after just one year was motivated by “growing frustration with the military and disgust over the duplicity of wartime propaganda” in which he had played a part (2013, p. 24). Hamaya’s Snow Land was clearly motivated by a sense of dissatisfaction with the state of modern Japan in the 1940s and 1950s. This dissatisfaction was not only attributable to a hollowing out of daily life considered to be a universal experience of modernity, but also disillusion with the promises of the fascist state. In that sense, Snow Land can be understood as a critique of modern life, and an attempt to rediscover a more fulfilling mode of living for Japanese society. On one level, therefore, we might dismiss this project as a simplistic and “well-known habit of using the past, the ‘good old days,’ as a stick to beat the present” (Williams 1973, 12). However, as the discussion above demonstrates, the manner in which nostalgic representations of the rural in Snow Land elide historical contingencies is the product of a particularly modern way of seeing the world as a pre-formed picture. The space depicted in the book reflects not so much the material realities that Hamaya photographed, but the idealised notion of the rural space as a heterotopia, a singular utopia distilled from real physical spaces in Japan. It can therefore be argued that Hamaya was deeply embedded in a modern consciousness which, as Heidegger contended, objectified the natural world as a picture, an already-posited conceptual space available for observation and recording by the modern subject. We can interpret Hamaya’s depiction of the snow country as constituting an unconscious iteration of both universal discourses of modernity, and discourses specific to the 1940s and 1950s Japanese context. By representing the countryside as an icon, Hamaya channels discourses of nostalgia for a pastoral golden age in Japan. 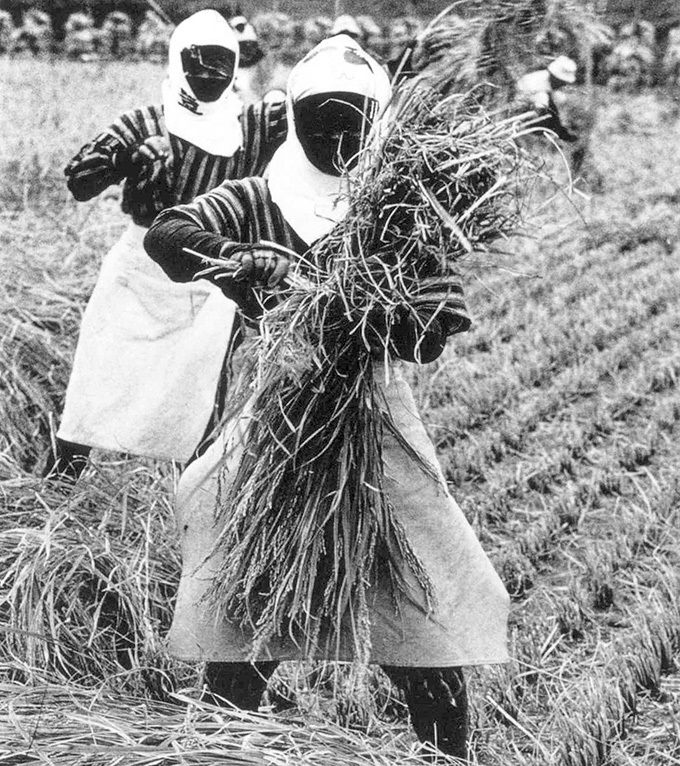 In the context of wartime Japan, such discourses of agrarianism served state ideology: they were intended to unite the populace according to state imperatives. In fascism, the inherent contradiction at the heart of the binary relationship between centralised, teleological modernity and an externalised, ahistorical understanding of the countryside became apparent. In order to fuel progress, the modern centre must consume its rural periphery in both a material and ideological sense. As a product of Japan’s urban centre, Hamaya perceived the snow country space according to the worldview of a modern individual. The photographic representations that he created offer a pastoral landscape that stands before modern individuals as a peripheral and objectified space. This space is produced by those in urban centres as a salve for the crises of meaning and identity in modern life. Barthes, R. 2009. “The Great Family of Man.” In Mythologies, edited by A. Lavers. London: Vintage. Brass, T. 2000. Peasants, Populism and Postmodernism: The Return of the Agrarian Myth, The Library of Peasant Studies. London: Frank Cass. Cornyetz, N. 2009. “Fascist Aesthetics and the Politics of Representation in Kawabata Yasunari.” In The Culture of Japanese Fascism, edited by A. Tansman. Durham and London: Duke University Press. Derrida, J. 1976. Of Grammatology. Translated by G. C. Spivak. Baltimore: Johns Hopkins University Press. Fabian, J. 2002. Time and the Other: How Anthropology Makes its Object. New York: Columbia University Press. Hamaya, H. [濱谷 浩]. 1971. Senzōzanzō: shashinka no taikenteki kaisō [潜像残像―写真家の体験的回想]. Tokyo: Kawade shobō shinsha [河出書房新社]. ————. 1997. Hiroshi Hamaya: Sixty-six Years of Photography (Shashin no seiki: Hamaya Hiroshi shashin taiken 66-nen [写真の世紀：濱谷浩写真体験六六年]). Tokyo: Tokyo Metropolitan Museum of Photography (Tōkyō-to Shashin Bijutsukan [東京都写真美術館]). ————. 1977. Snow Land (Yukiguni [雪国]). Tokyo: Asahi Sonorama. ————. 1957. Uranihon: Hamaya Hiroshi shashinshū [裏日本:濱谷浩写真集], Tokyo: Shinchōsha [新潮社]. ———— . 2009. “Constitutive Ambiguities: The Persistence of Modernism and Fascism in Japan’s Modern History.” In The Culture of Japanese Fascism, edited by A. Tansman. Durham and London: Duke University Press. High, P. B. 2003. The Imperial Screen: Japanese Film Culture in the Fifteen Years’ War, 1931–1945. Madison: University of Wisconsin Press. Karatani, K. 2012. History and Repetition. New York: Columbia University Press. Kawabata, Y. 2011. Snow Country. Translated by E. G. Seidensticker. London: Penguin Classics. Maruyama, M. 1963. “Agrarianism.” In Japan 1931–1945: Militarism, Fascism, Japanism?, edited by I. Morris. Boston: D. C. Heath and Company. ———— . 1969. Thought and Behaviour in Modern Japanese Politics. London: Oxford University Press. Ohnuki-Tierney, E. 1993. Rice as Self: Japanese Identities Through Time. New Jersey: Princeton University Press. Orto, L. 2003. “Hamaya Hiroshi.” In The History of Japanese Photography, edited by J. Junkerma New Haven: Yale University Press. Picken, S. D. B. 2004. Sourcebook in Shinto: Selected Documents. London: Praeger. Reynolds, J. M. 2013. “Hiroshi Hamaya’s Snow Country: A Return to ‘Japan’.” In Japan’s Modern Divide: The Photographs of Hiroshi Hamaya and Kansuke Yamamoto, edited by J. Keller and A. Maddox, pp. 17–29. Los Angeles: J. Paul Getty Museum. Said, E. 2003. Orientalism. London: Penguin. Shirayama, M. 2003. “Major Photography Magazines.” In The History of Japanese Photography, edited by J. Junkerman, pp. 378–385. New Haven: Yale University Press. Steichen, E. 1955. The Family of Man. New York: Museum of Modern Art. Stimson, B. 2006. The Pivot of the World: Photography and its Nation. Cambridge: The MIT Press. Tanaka, S. 2004. New Times in Modern Japan. Princeton, New Jersey: Princeton University Press. ———— . 2009. “Introduction: The Culture of Japanese Fascism.” In The Culture of Japanese Fascism, edited by A. Tansman, pp. 1–28. Durham and London: Duke University Press. Williams, R. 1973. The Country and the City. 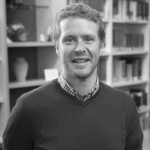 London: Chatto & Windus Ltd.
Ross Tunney graduated from the University of Tasmania in 2012 with a Bachelor of Arts (Hons) specialising in Asian Studies. In his final year, he wrote a dissertation that explored issues of identity and representation in Japanese photographer Tōmatsu Shōmei’s photographs of American servicemen and Okinawans in Japan. He is currently enrolled in his third year of a PhD at University of Tasmania. Ross’ research remains focused on issues surrounding representation, modernity, nostalgia and landscape in post-war Japanese documentary-style photography. His PhD thesis will take a broad view of this period, paying specific attention to the discursive patterns found within much of this work. Ross’ background in photography stems from a personal interest in the area, both as an amateur practitioner and admirer of the genre. Ross Tunney was selected for the 2016 New Voices Scholar Program.